It has nice details and is well done. "Gina"**5x7**Diamond Girl Art *So ORIGINAL & VERY RARE! 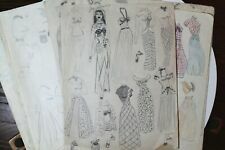 Original Signed Drawings by Yolanda C.
These drawings are all for sale. J. Mather (20th Century). Fantastic composition by J. Mathers depicting a sultry fantasy romance novel illustration. This is a fine example of Mather's work in great condition. We do not overly enhance the photos. 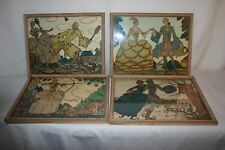 This is a four piece set of original artwork done by Guy Paul Andre Arnoux, born in Paris, France 1886 and died in Ardon, France in 1951. Signature: Guy Arnoux. The framing is a simple hardwood but in poor condition. Armand Henrion born in Liege, Belgium May 30, 1875, died in Paris in 1958. ARMAND HENRION. Size 12"h x 18 3/4" w. Mat has discolored due to age and paper.EXCELLENT CONDITION NO FOXING, CREASES,TEARS OR STAINS. Piece is penciled in shades of brown, red, green, blue, grey, orange, yellow, & white. "Beach Shower II". This belongs to my Beach & Pool Series. an Art Show. I have sold all over the world. Not going to happen. I was classically trained in drawing and anatomy. I attended PA Governor's School of the Arts. I graduated from Indiana University of PA with a Fine Arts degree and a concentration in Printmaking. Reminiscence of the Baroque period of Western art history. I believe that these originals are from the 1950's. Lots of great detail that shed light on what was stylish. Or get inspired if you're a fashion designer! Piece is penciled in blue & light flesh. This belongs to my Body Parts Series. No part of the body is off limits here, male or female. an Art Show. I have sold all over the world. Not going to happen. It has nice details and is well done. It is done on Cresent Illustration Board. It has nice details and is well done. It is done on Cadet Artist Illustration board. ORIGINAL ROLLIN KIRBY. Title: Pipe Night by Rollin Kirby. on TAN paper board. Age: Circa, 1900. Signed: and dedicated by hand, on lower right. I was classically trained in drawing and anatomy. I attended PA Governor’s School of the Arts. I graduated from Indiana University of PA with a Fine Arts degree and a concentration in Printmaking. This is the actual drawing, NOT a print or reproduction. Very Funny Jewish Humor Original Drawing. 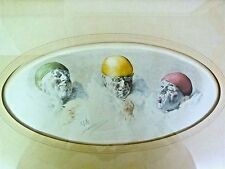 Signature is not blurred in painting. most accurate color representation possible. However, due to variations in different computer monitors, the image on your screen may vary from the actual product. He is an unusually versatile and productive artist whose lengthy career and extensive teaching have influenced generations of younger painters. In addition to his extensive oeuvre of easel paintings, Navarro has also completed a number of significant public mural and sculpture commissions. "Say AAAhhh" (4). Piece is drawn in red and yellowish flesh. Colors are a little lighter than picture shows. This belongs to my Body Parts Series. No part of the body is off limits here, male or female. Simon Nathan Karczmar (1903-1982), Rabbi holding Rooster, Framed 12 "x 13 1/2"
The nostalgia of Karczmar's renderings contrasts with the darker views of life for Jews revealed in the photographs by Vishniac and drawings of Lilien. The nostalgia of Karczmar's renderings contrasts with the darker views of life for Jews revealed in the photographs by Vishniac an orld War II, Karczmar depicts similar scenes yet focuses on the sense of community and tradition. Milionis' success is even more remarkable given that he seldom exhibits in mainstream galleries. A quiet man, Milionis uses his art to advocate human compassion, with a critical approach to history and current conditions of inter-cultural understanding, equality, and justice. Gilberto Navarro (b.1931). Fantastic composition by Gilberto Navarro! He is an unusually versatile and productive artist whose lengthy career and extensive teaching have influenced generations of younger painters. Sparks The Pulley Bot. Contemporary Outsider. Stephen Neil Gill. Mid Century Modern. In The USA. Piece is penciled in shades of grey, black, & red. "Cowboy Ties". This belongs to my Cowboy Series. If you think it's about cowboys, your right! Not going to happen. an Art Show. I have sold all over the world. It is indistinctly signed on the lower left hand corner. Garden of a Chateau, signed, 1920's - 1930's. We give the history of an object to the best of our abilities, but we may make mistakes. Very sweet picture. Artist Background:- MD Native, Veteran and Graduate from the Maryland Institute College of Art (Graphic Design/Fine Arts). East CoastOriginal Artwork, Titled: "Mother and Children" ~. ‘It is not too late'. Sort of an Andy Warhol tribute. All are hand drawn and colored. Piece is penciled in yellowish flesh. This belongs to my Body Parts Series. No part of the body is off limits here, male or female. STEPHEN NEIL GILL. Stephen Neil Gill. #NEXT YEAR. 12"H x 9"W. on Acid Free Paper. T his lovely antique French ink and watercolor wash on paper depicts a woman in antique dress in a pose typical of French classical theater. Antique French Ink and Watercolor Drawing, Woman, Tragic Actress. I was classically trained in drawing and anatomy. I attended PA Governor’s School of the Arts. I graduated from Indiana University of PA with a Fine Arts degree and a concentration in Printmaking. Reminiscence of the Baroque period of Western art history. "How Glenda Really Gave Dorothy the Ruby Reds". My version of how Glenda gave the ruby red shoes to Dorothy. Piece is penciled in shades of black, yellow, red, pink, green, & white. It has been sprayed but wouldn't touch any more than have to. Stephen Neil Gill. Google Stephen Neil Gill. on Acid Free Paper. 12"H x 9"W.
Original Signed 1961 Color Drawing Conte Crayon Female Portrait of Woman 12x18" on tan paper. Contemporary Outsider. Stephen Neil Gill. Mother and Child Blooming. Mid Century Modern. Ink and Marker on Paper.